Don’t you just love quilting? Got Dave to make a template to cut the wedges and completed this yesterday from stash and scraps. 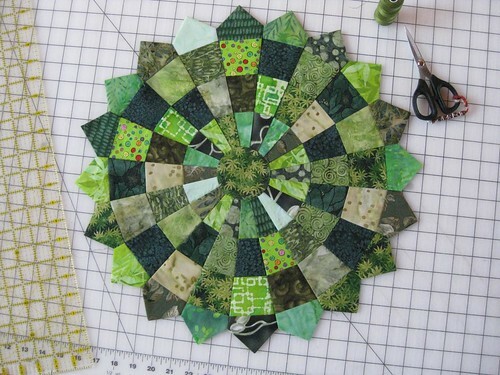 I think I will call it “Scraps on a Plate!” Check out Lurline’s tutorial. I’m going to do Christmas fabrics. Lillian and Marlene, I am thinking of all kinds of cool color ways. Black and white checkerboard with a red center, gradient color fabric fading from dark on the outer ring to light for the center circle, or just two colors alternating. We will see what everyone comes up with tomorrow.